The Auto Marketing Blog: Is GM Marketing Trying To Kill Two Brands? First, AgencySpy had someone share a Weather.com ad placement sponsored by Hummer promoting "Green Is Universal" on Thursday's homepage. Green + Hummer? Okay, that has to be just about the worst sponsorship buy decision, couldn't the GM Total Confidence team bring Chevy Volt into the sponsorship? Or is this a way to further kill Hummer as GM sheds its brands under restructuring? Who knew online media was part of the plan to bury the Hummer brand. 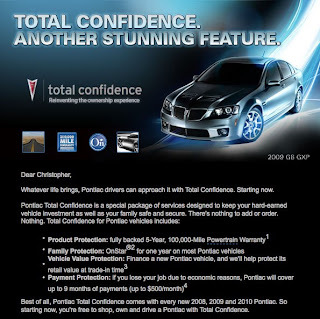 Then tonight I received an email marketing message from Pontiac with the subject line "Pontiac: Drive with Total Confidence", this on the day every automotive news outlet is reporting GM to "Kill Pontiac", not exactly the most confidence inspiring action to lure new drivers. Maybe GM marketing is not very happy about the announcement of 20% of GM's marketing department to be laid off? GM never figured out how to utilize the brands. They had the theory. But the right practices never followed. So this is where they end up. Executive summary of GM reportCalled for radical changes, so I knew they'd never act on it. I found your line, "The current level of 'creative tension' makes nearly every product detail a potential battle" very telling of a lot of organizations. I also wonder, in a down economy, if this issue isn't exacerbated by people worrying about losing their jobs and, therefore, deciding to not cause tension. All of this then resulting in poor product development. This definitely is a sad time for GM, hopefully they will be more responsible in the future. I wonder if Pontiac will disappear forever or if the economy gets better they will bring it back. What are your thoughts. First and foremost, I feel for the families who work directly and indirectly on the Pontiac brand. Also, the communities where dealerships are a cornerstone of the jobs and charities. Will Pontiac disappear forever? Most likely yes, very rarely are brands resurrected after being discarded. The exceptions are usually high-end marquees like Maybach. I doubt Pontiac will return since I'm sure GM will try to move the driving excitement aspect to Chevy, since Chevy has some strong performance models already in the new Camaro and existing Corvette.